Holy Moses Nige!!!! Looks great and seems to be coming togather rather nicely. Only question I have is do you have any Vino or hair left after all the wiring? And you said that I was fast before? You're moving like lemmings on speed! Nige, I'm sure you probably get tired of hearing this but you do amazing work. I can't believe the level of detal you get out of a 1/72 kit so this one being a million times bigger should be amazing. Hermon, I just try and do the best I can at the time. Drives me mad sometimes as I do find myself getting FAR to involved in a build. So, some progress on the VFS build. Another bit of the engine is done. I added the first line of exhaust ports and the mounting rings. I cant emphasise the importance of dry fitting on this enough. Each stage I glue I probably dry fit 2 or 3 stages ahead. The dryfitting for this section led to dryfitting the rear fusalage fillet! This is the maximum amount of engine that I'm planning on having visible.At the moment I'm thinking that the port cowling panel will stay intact so that the noseart( if any) will always be on the plane, and haviing the option of removing the top and maybe the starboard panel. I found that making up a jig helped a lot while building the engine. All I did was make a hole in a piece of polystyrene to keep the engine flat and nose down. The piece of cardboard ensures that I'm able to keep the bottom of the engine in its correct orientation and helped when lining up the mounting rings. I also taped this over the jig while it dryed overnight. Wow Nige as stated before. It really is a model all onto itself. I can see why it is so easy to get carried away with details. Excellant work as usual she seems to be falling togather for you. That's a pretty looking powerplant you've got there, so I would recommend you to leave two panels removable. What you see is what you get, they say, and I think you should see a lot of this! However, have you set the spark plug gaps correctly? They should be at least 0,7 / 24 = 0,03 mm for a strong spark on a turbocharged engine. The back of the engine is now finished. From the rear mounting ring back this wont be seen. Ive started working on the oil tanks/firewall area. Because I'm not going to cut any of the fusalage away this wont be seen and its purpose will be more structural than anything else, so I havent been too precise in cleaning up the parts. Soon be time to join up the fusalage. The instructions call for you to join the fusalage fillet together and then place it on top of the fusalage section. On a dry run I found that assembling it like this would have resulted in a step down each side of the fusalage. To combat this I glued each part of the fillet to its respective side first. I did this in stages, starting at the cockpit area and over a couple of days gradually glued along until I got to the fin area. The fit will still require a small amount of filling and cleaning up to finish it off but at least theres no step to deal with. hi your build looks great lots of insperation to keep us going . or i could have just built it up wrong ? The rear part of the engine was fitted as per instructions. There are two small rims that line up with the inside of the ring it fits into. I've sanded these off and can now fit the carburettor duct correctly. It just goes to show how important dry fitting is on this kit. I've also had to file away the locating lug on the crankcase cover at the front of the engine so that lines up correctly too. I have promised to take the engine and cockpit along to a show with The Bulldogs at the weekend and will be getting the fusalage together after that. Dry runs on the fusalage are very encouraging and I dont think any filler will be required. Its certainly a big old kit eh? Err which show is that as I have nothing in my diary for this weekend? Well,,its 2am here, and I have had a very frustrating few hours trying to get the &%"*&%^ back half of the engine to fit into the fusalage. Maybe it's ( I'm sure it is) something I've done but I cant get the thing to line up. Essentially, the problem I've been having is that the back half of the engine (oiltank area etc), has been trying to push the top half of the engine down and so out of line. I'm thinking that I really cant be bothered with spending another couple of evenings struggling to get a sub assembly to fit that wont even be seen once the fusalage goes together. Having to spend another hour rebuilding the engine after it started to fall apart through all the handling has contributed to that decision as well. Anyway, to try and restore some of my sanity and regain some enthusiasm I dryfitted the majority of the airframe. Its worked,,,I like it ....................A LOT! The baby bolt is the Revell D30 I'm working on. Holy smokes!!!!! Looks like the little one final approach to land on it.. Looking great Nige are you sure you were not a Republican Line worker in a former life. You are kicking them out as fast a they did. Does that gap in the wing root and cowling look as scary in real life as it does from here? I know its a dry fit but Yikes!!! In general, the fit of the major parts is very good. Some parts will require a bit of work, but its more a case of removing plastic than adding filler. Your right about the paint Taylor! I think I'll just order a couple of tins of each colour right now and have done with it,,lol. Regarding the rear area of the engine, if I really had to make it fit I could, but as I have no plans to display any of that area, and none of it will be seen, I'm just going to leave it out. After the trouble you gave Dave about the wiring of his engine! Ok I am calling Dave and Russ. That is a shame though Nige. All that work you put into that engine and now this. Its not the actual engine thats giving me the grief, its the section behind it with the oil tanks and carburetter ducting etc. The engine wiring etc will still be seen. None of the section Im considering leaving out ( its leaning against the wing) would be seen without cutting away panels on the fusalage. Rather than being a case of "I know its there", this could well turn into a case " I know it isnt there"
Myself and Dave discussed this section a couple of weeks ago in an email conversation so I wont be made to feel guilty,,lol. As I said in an earlier post, if I had to, I could make it fit. Maybe have another try when I come to join the fusalage sections next week, but now I know its not 100% necessary the motivation to get it in there has dwindled. Im very interested to know how Dave and Johnny get on with their kits at this section. Put it this way...its a challenge !! remove a couple more panels so you can see your work and go for it !! you only ever build one of these things :-))......I think. good luck which ever way you chose to go...watching with interest ! No guilt intended Nige just poking aq little fun is all. Seeing the assembly I can see the your delema. Seeing the assembly though it kind of looks like the Engine, in that it is a model all to itself. If you decided to leave it out you could always finish the duct work on it and display it as a model in a model. So far I'm very very very envious. The job you have done so far is brilliant, the amount of detail WOW. Are you going to do an article? hi Nigel. Had all same probs on engine your build looks great . also same in fitting into fusalage. It seems the pipe ontop catches on the rim right on the front edge of the fusalage ,i have reduced it and it seems to be ok on dry run . had to do it as i had cut out panels to view the rear part ho de humm. but still enjoying the build a lot .Jonny. Thats the area where mine was catching Johnny and trying to lean the front part of the engine assembly forward, so I'm glad it wasnt just something I'd done. With the fusalage panel removed are you going to add the Cammet AM parts? They are a small framework that will glue onto the inside of the fusalage I believe, but I havent had a good look at a set. At least it balances out now. Yours with fusalage panels off, mine with just cowling panels off, and Daves with no panels off. The NMF on yours is shaping up to be a showstopper!! Daves will be black/nmf and mine will be,,well,,,,,,,,,undecided just yet,,lol. 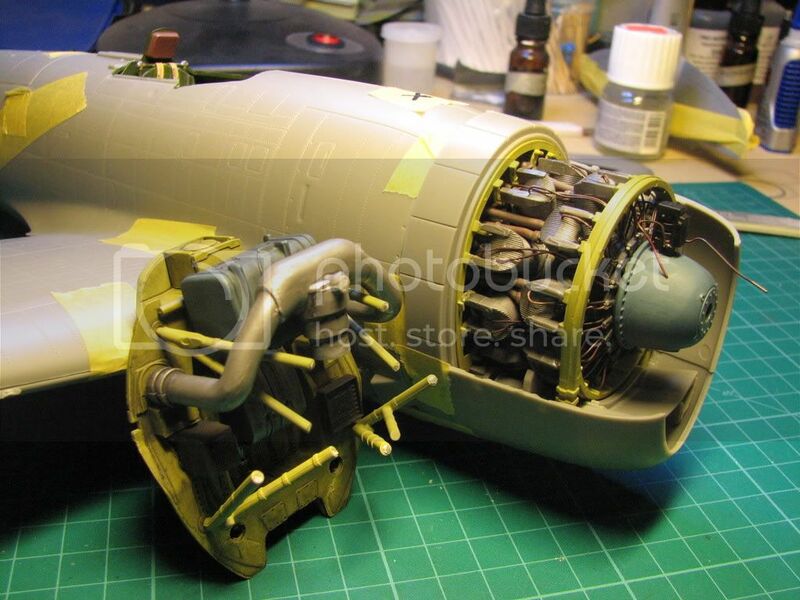 Did you see in Daves "Lorene" thread where he's raised the cockpit sub assembly slightly? I've tried it on a dry run with mine and its made a load of difference. Its certainly a challenging and also very enjoyable build. Thanks to Dave for the heads up on raising the cockpit. Its easy to do and it works really well. Fusalage halves are joined and Ive been working on cleaning up the seams. But Im using Mr Surfacer around the fillet. Horizontal stabilisers are together and Im working on dry fitting the wings. Two points to watch out for here. I had to do some work on the leading edge/fusalage join in order to eliminate the pronounced step.Nothing major but its made the fit a lot better. A lot more work will be required on the flaps though. These are assembled in the same way as a Tamiya kit. The instructions show the flaps in the raised position but the flap actuators supplied are for the down position. This is ok as its how I want to have them on the model, but the actuators will need a lot of work in order for them to fit. I've sanded one down, and from the photo you can see how much I've had to remove from the kit part in order for it to fit into the wing. Plenty more dry fitting for me this week!